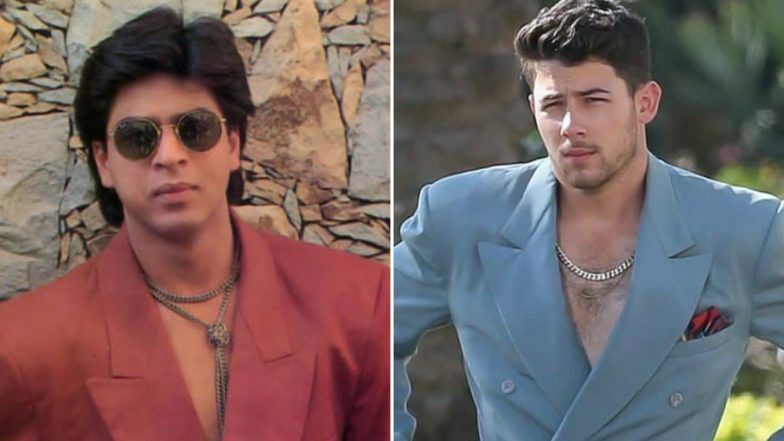 Nick Jonas' Look From 'Cool' Music Video Was Donned By Shah Rukh Khan 24 Years Ago - See Pic! The video of Jonas Brothers'new song, 'Cool' had its video released this morning and we are already grooving to this 'Cool' number. The song featuring Nick Jonas, Joe Jonas and Kevin Jonas had the trio looking all handsome in coloured suits. Nick Jonas was seen wearing a blue suit in the song and we have to say Priyanka Chopra's husband is equally as stylish as his lady love. Although in case of his latest look in the new song, we believe Nick may have picked up a few style tips from a Bollywood superstar. Wondering who? Well, it is none other than Shah Rukh Khan. Unfortunately, though, we have to say Nick is at least 24 years late. Shah Rukh had sported a similar suit in the shade of Pink during his Ram Jaane (1995) days. As soon as the video of Cool was released, there were a few fans who realized they have seen a similar look on Shah Rukh years ago. Jonas Brothers' 'Cool' Song: High on Elvis Presley Vibes, the Trio in Coloured Suits Will Make You Groove to Their Beats. The Jonas Brothers recently reunited and made a smashing comeback with Sucker, that even got them a No 1 spot at the Billboards Hot 100. Their new track is equally receiving positive reactions from fans. Looks like the Jonas Brothers are back for good.